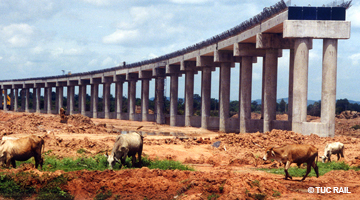 Project description Construction of 24 km of new railway lines due to the construction of the “Mae Nam Pasak Dam” in Thailand. This project involves the construction of a new single track line in the artificial lake: 5.7 km on 5 viaducts, on 4 bridges and on 18 km of a single track embankment. TUC RAIL's assignment Review of the preliminary design of the new bridges and preparation of a preliminary construction schedule.